From the moment on a 2016 November Monday that Shawn saw Elaine in the Trader Joe’s dairy section, he had to talk to her. The woman practically glowed. Shawn strategically took the second aisle — his best guess at the path she would take next — and soon: Voilà! “Have you tried any good seafood?” he asked, heart racing, as they stood before the frozen fish and bivalves. Scallops in his cart, they introduced themselves and quickly discovered a common love of teaching and music. Elaine, who then lived in Wayne, is a classical musician — an organist who plays and teaches music to young people as associate director of music at St. David’s Episcopal Church. Shawn, who lived in his hometown of Malvern, teaches eighth-grade history at Great Valley Middle School. Both were intrigued. She gave him her number. He called the following evening, and they made plans to meet two days later at Starbucks. “We sat down and talked for a good two hours,” Elaine said. They’ve been together ever since. Within a year, they began talking about marriage. In March 2018, Elaine knew a custom ring was in the making, and Shawn pointedly hinted that the April Phillies game where Elaine’s choir would be singing the national anthem was the perfect time and place. Easter weekend, as they prepared for the holiday, he casually suggested lunch at Panera Bread in the Gateway Shopping Center. Elaine thought it was a great idea. “I need to go there anyway — I have to stop at Trader Joe’s,” she said. Shawn was delighted: Elaine had unknowingly played right into his plan. Elaine Sonnenberg and Shawn Whitelock Shawn proposed to Elaine in the very place he met her — the frozen seafood section at Trader Joe's. A stranger snapped this photo for the couple with Shawn's cell. “Are you proposing right now?” asked the lady with his phone. “Will you marry me?” Shawn asked Elaine. She said yes, the cellphone photographer cheered, and soon everyone in that aisle and beyond was congratulating them. The front-end crew rang their cash register bells. Someone brought them flowers, and someone else brought cake — which happened to be one of the day’s free samples. The couple wed in a music-filled afternoon at St. David’s Church that began with a full procession of the three church choirs — adult, youth, and children’s. As Shawn’s mother, Rosemary, was seated, the handbell choirs played. Elaine’s Indiana University music professor, Marilyn Keiser, played the organ. The traditional Episcopalian ceremony was lead by St. David’s rector, the Rev. Frank Allen. The bride’s Uncle Marv read the prayers. The service was followed by a full recessional with choir and acolytes. Everyone from church was invited to a high tea put on for the couple by St. David’s parishioners. About 300 guests enjoyed tea, scones, and tea sandwiches. An evening reception for 100 was held at the Desmond Hotel in Malvern. The couple did their own choreography for their first dance, to “L-O-V-E” by Nat King Cole. Elaine Sonnenberg and Shawn Whitelock On the way to the couple's evening reception, their trolley stopped at Trader Joe's to snap a picture where they met and got engaged. Shawn holds a bag of the frozen scallops Elaine recommended to him. En route to that second reception, the bridal party’s trolley stopped at Trader Joe’s so the couple could get their picture taken with a bag of scallops. A bargain: Elaine’s mom made five velvet and satin shawls for the bride and bridesmaids, plus the flower girl’s dress and cape. “I told my mom she should open up a business,” Elaine said. The splurge: The couple took to heart the advice of friends and family who said photography was the last place to try to save money. Tom Fuller did an incredible job, they said. The couple, who live in Malvern, spent five days relaxing on the beach in Playa del Carmen, Mexico. This summer, they’ll spend nine days hiking in the Swiss Alps. Officiant: The Rev. W. Frank Allen, St. David’s Episcopal Church, Wayne. Ceremony Venue: St. David’s Episcopal Church, Wayne. Reception venues: St. David’s Episcopal Church; the Desmond Hotel, Malvern. Food: St. David’s parishioners; the Desmond Hotel; the Master’s Baker, West Chester. 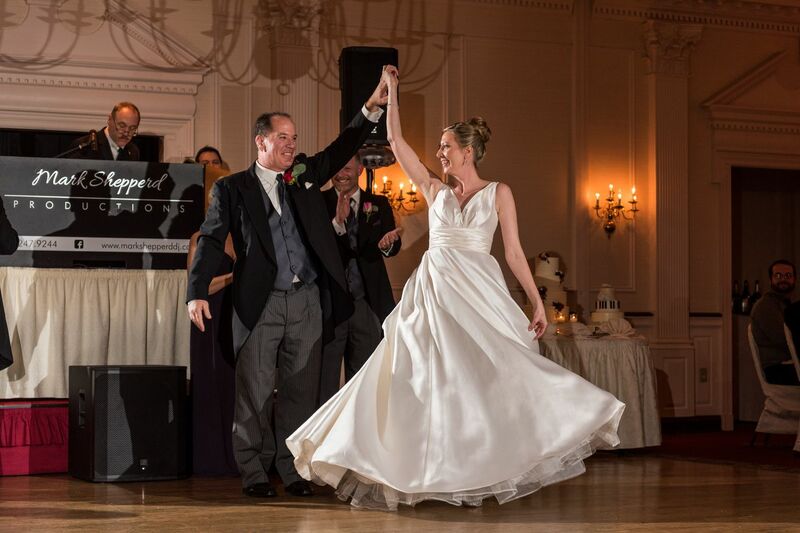 Reception music: Mark Shepperd Productions, King of Prussia. Photography: Tom Fuller, Fuller Photography, Philadelphia. Videography: Geoff Chamberlain, St. David’s Episcopal Church. Flowers: Jill Bonn, St. David’s Episcopal Church; Petals Florist, King of Prussia. Dress: Plaza by Pronovias, purchased at Bijou Bridal, Ardmore. Hair/Makeup: Studio H Color & Design Group, Heather Heyman and Zary Pardakhti, stylists, Paoli. Planner: Judy Krischker, St. David’s Episcopal Church, Wayne. Transportation: Philadelphia Trolley Works, Philadelphia.